I wanted to do something in my kitchen, but just couldn't figure exactly what I wanted. I then had this idea. I wanted to make it inviting and cozy all at the same time. I searched online for the perfect saying and this is the one I settled on. 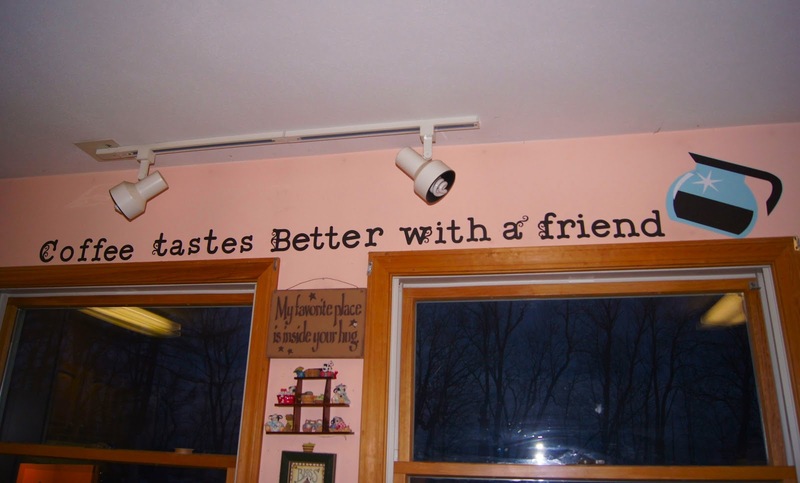 "Coffee tastes better with a friend". How true that is. Sometimes we may take a friend for granted because they're just there, but when you truly need a friend to be there for you, you know there's that one friend that will do just that for you. That will be there no matter what. Then to enjoy a cup of coffee or tea with them just makes it all the better. Now on to my project that I bring to you from my cozy home. I used Cricut Craft Room to design my project and get the sizes just right. If you do not have Cricut Craft Room then you can just click the words there on either one and you'll be taken right to where you can get Cricut Craft Room. You can get the PC or Mac edition or you can use the web based one; mind you with the web based you can design, but will not be able to cut. 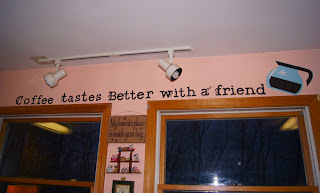 For right now this is with a heavy cardstock that I used to put it up there, but will be replacing it with the Cricut Vinyl to make this more of a permanent fixture for my kitchen. I wanted to do a test run first to see how I'd like it before using all my vinyl stock to make this. I am really liking it. Now to get to work on the vinyl side of things. I cut the letters at 3" I used the Cricut Alphabet Cartridge in Fonts 1 and 3 for the lettering... there was just something catchy about the style of lettering that I liked. I then cut the coffee pot at 7.75" I really like the size of it and the coloring for the peachy kitchen that my Grandmother Gigi painted it. The coffee pot I'm sorry I didn't mention it, but it is from the From My Kitchen Cricut Cartridge. I really love my peach kitchen. Will have more projects for you soon. Have a wonderful evening everyone! !